I’ve found that most folks only deal with logs after a disaster strikes. Production is down, check the logs! Much like backups, a failure to proactively collect and store logs means there is no going back to magically find the logs, and troubleshooting is made significantly more difficult. In fact, many vendor support organizations will ask that you then turn on logging to some safe place and wait for disaster to strike a second time so that they can determine root cause. Bleh! Let’s collectively get into the habit of treating logs like production data by making sure they are continuously gathered, protected, and reviewed for issues. And what better place to get your feet wet than a lab environment? 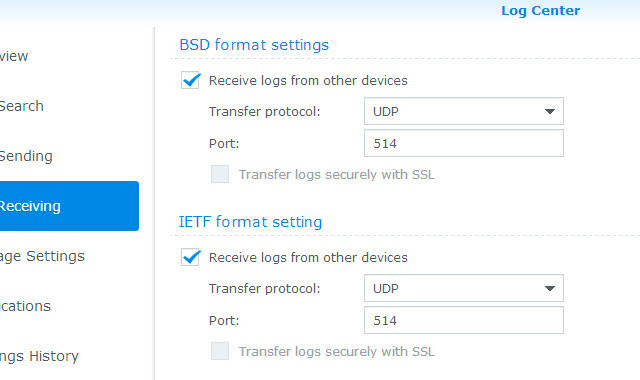 In this post, I’m going to transform my Synology DS411 NAS into a Syslog server using DSM 5.0. In DSM 5.0, the ability to become a syslog server is native – the packaged application that was required in DSM 4.0 is no longer necessary. Begin by opening up the Log Center and configuring the Log Receiving and Storage Settings areas. Start off with the Storage Settings menu. You’re required to specify a destination for the syslogs. I ended up just making a folder named Syslog and checking the boxes for Compress log archives and Archive logs separately according to device as shown below. The next step is to enable Log Receiving. I checked the box for both BSD and IETF formats. Note that UDP is the default protocol and is typically what I use. Let’s point a few ESXi servers to the new syslog server. From the vSphere Client, navigate to a Host > Configuration > Software Advanced Settings > Syslog > Global. 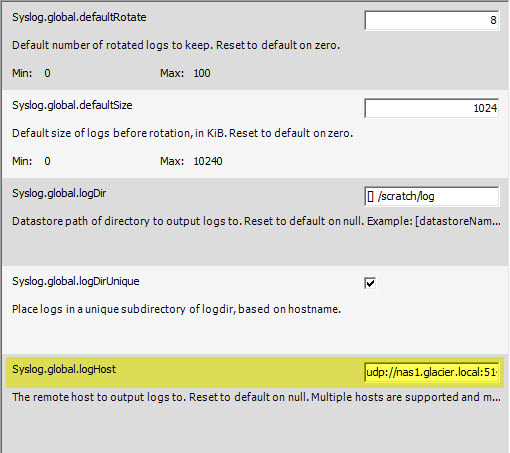 The specific setting is Syslog.global.logHost. Repeat this process for any other hosts in your environment, or just use a PowerCLI script. Get-VMHost | Set-VMHostAdvancedConfiguration -Name Syslog.global.logHost -Value "udp://nas1.glacier.local:514,udp://10.0.0.84:514"
Get-AdvancedSetting -Entity (Get-VMHost) -Name syslog.global.loghost | Set-AdvancedSetting -Value "udp://nas1.glacier.local:514,udp://10.0.0.84:514"
I also found this KB entitled Configuring advanced options for ESXi/ESX to be educational. Also, you might want to peek at Jon Kohler’s blog post on why TCP or SSL are better protocols to use for vSphere (instead of UDP). Keep in mind that the Synology NAS cannot do both UDP and TCP at the same time, so you’ll have to pick one protocol. Since almost all of my systems default to UDP in the lab, I’ve chosen that protocol. After pointing a few other devices to the DS411 Syslog server and port, I saw logs coming in. By clicking on the Overview area, a list of incoming logs are shown in a graph. The “localhost” entity is my NSX Manager, which was never renamed to anything fancy. I really should rename it to something more descriptive. Here’s another view while powering down a bunch of virtual machines in the lab at once. Not too bad of a feature, and now my DS411 is doing a lot of nice little utility stuff that I had scattered around the lab. For example, I used to use vCenter as my syslog server, but this seems much more efficient. Is it as robust as Log Insight or other commercial products? No way. 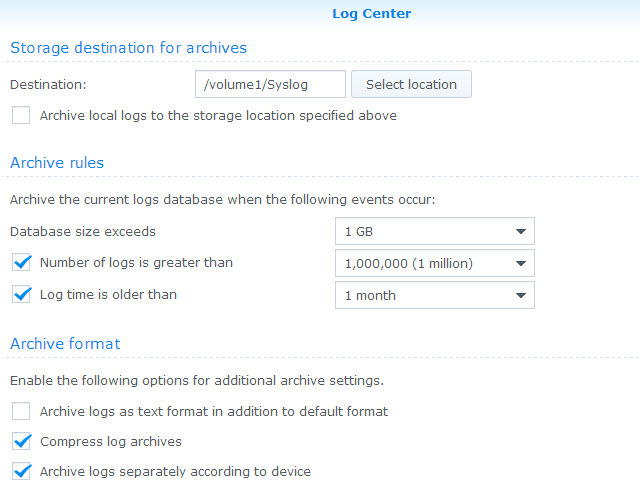 But if you own a Synology NAS, you already own the ability to collect logs, so why not use it? Another step for “ESXi Configuration” would be to enable syslog in the firewall settings. It’s disabled/unchecked by default. That’s pretty cool! Good idea! Mine also did not function until I enabled the firewall rule. can cisco network devices logs go to synology syslog server?